If Ritual Humanism® is a non-theistic philosophy, then who do we call on for wisdom, growth and awakening? In Ritual Humanism,® we believe that each individual is the highest power in their own life, therefore “higher self” is a much more appropriate term than god. Our definition differs from what you find in sources like Wikipedia, which describes higher self as "a union with a divine source." Let me explain what we mean by “higher self”. Most of us tend toward being either "Emotional Self" or "Scientific Self." The person who is led by emotion usually has some kind of artistic talent. Musicians, Artists, Dancers, Designers, Interior Decorators, some Engineers, writers, poets… you get the idea. Even those who are not professionally artistic will bring an artistic bent to everything they do. Even some scientists’ couldn’t do their jobs if they didn’t have a creative side to their thinking. For example, one of my stepsons is a mechanical engineer. Normally, he thinks very logically and makes sure he has all the facts available to him before he makes a decision. Yet he saw me cover a pillow one evening and took some fabric and the sewing machine and made a cover of his own. His job is to take other people's inventions and make the reality. He once made robotic hands that could sweat so that they could be used for testing fabrics for gloves. He is definitely a scientific person, but it takes a lot of emoting to create the way he does. My other stepson is an emotional person. He loves heavy metal music and wears his hair nearly down to his knees. Professionally, he manages ticket sales for the Seattle Opera. He is my editor because he has an ear for language. He knows how to say what you mean and communicate effectively. 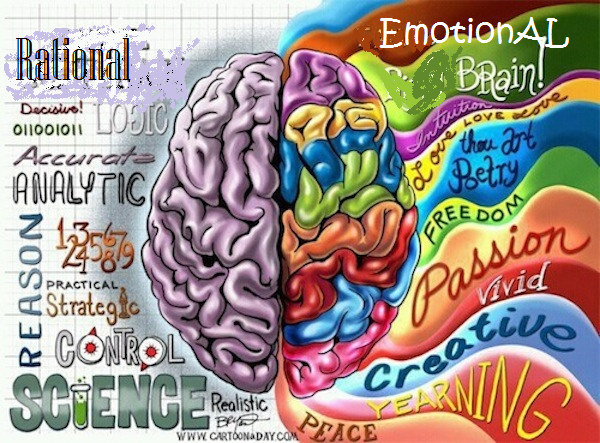 Once in a while you will find a person who naturally combines both sides of the brain. Most often they have been trained to do so. If you know a person who is balanced in this way and appears to have a wise answer to profound questions, I hope you seek their advice often. Perhaps my step-sons were taught their balance by their parents. Come to think of it, their mother is a musician and their father is a science teacher. (I didn’t come along until they were grown). So spend some time figuring out which you are and then begin to practice the other side. Those who are evenly divided, using both reason and emotion to govern their lives are said to be using their “higher self”, the best of both worlds. These people have a much wiser and broader perspective of the world because they see both sides of every story. Some people call this higher self the spirit or the soul. Some refer to it as the universe because of its universal approach to life’s questions. We believe that the way to communicate with and train our higher selves is to meditate. One of the most frequently expressed fears I hear when it comes to meditation is, “I’m afraid I’ll do it wrong.” Well, let me reassure you, there is no way to do it wrong. We believe that when people pray, they are communicating with their higher selves. When you speak or sing in tongues, if you have ever done that, it is your higher-self that is communicating. Often when we sing, we sing from our higher selves. Meditation is much the same thing. Clear your mind, relax your body and just let your thoughts drift in and out of your mind. Don’t take it so seriously that you get nervous about it. There is no absolute way to pose, no certain way to sound, no special words to say except the ones you want to communicate. For example, you will see pictures of people sitting on a cushion or a bench to meditate and I have heard that this is a great way to do it. I, however, have physical disabilities that would make sitting is such a position excruciating in just a few minutes, so I lay on my bed. I get the same sensation of being supported by the mother earth as the Buddha got sitting under a tree when he was awakened. Make communication fun. Look for tools like divination cards or candles and incense. Here again, don’t take them too seriously. They are just symbols for our minds to get ideas from. Choose cards you like and forget the rules. Play with them in a way that appeals to you. Choose candles in colors that are meaningful for you. I like to use a lot of the pagan tools because I don’t have to reinvent the wheel. They are already available and have been given meaning. If you want to choose your own, however, go for it! Chants and Prayers to our higher selves is an excellent way to teach yourself wisdom. Your higher self can be experienced when listening to someone else and realizing that you can relate to what they are saying. You suddenly realize they are speaking the truth because it lines up with things you couldn’t explain before. It all makes sense. Sometimes your higher self is felt in the center of your belly or in the center of your forehead. Sometimes you can find it by following their breath in and out. Some people experience their higher self when making a decision that they know is absolutely the right thing to do. They know their higher-self because there is no sense of dread or anxiety. They just “know” they are doing the right thing. There will be absolutely no doubt. Your higher self is like the calm that follows the storm, something experienced immediately following a crisis or enormous chaos. You observe a situation from beginning to end without judgement, getting to the heart of the matter, seeing or knowing something directly or clearly. It is comprehending the big picture when only parts were understood previously. Or in some cases, just one thing doesn’t make sense. Then something hits you and it all clicks. You can also experience the right choice in a dilemma, when the feeling comes from deep within – or perhaps from “outside” rather from a current emotional state. Click for a summary of the Skills Ritual Humanism Will Teach You, or you can go directly to our first aspect, Mindfulness.